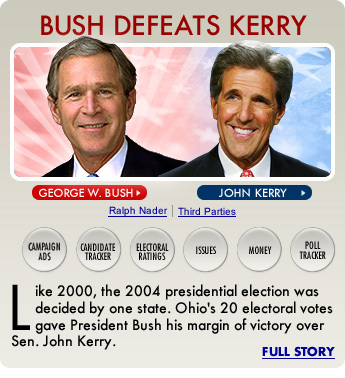 You have reached CNN.com's 2004 election coverage. For coverage of the 2012 election, you can visit the CNN.com 2012 Election Center: Elections & Politics. With nearly 600 federal and statewide races around the country, take an in-depth, interactive look at complete Election Night results. On November 2, the presidential race in 12 of the 15 pre-election showdown states was within 5 percentage points. After what many analysts deemed a dismal August for Kerry, the Democratic presidential candidate performed well and revived his campaign. In late July, Kerry accepted the Democratic nomination in Boston, announcing he was "reporting for duty." CNN.com users successfully predicted who Sen. John Kerry would choose as his vice presidential running mate in the quadrennial single elimination NCAA-style game. John Kerry defeated nine other challengers to win the Democratic presidential nomination with momentum building from the Iowa caucuses to March 9.